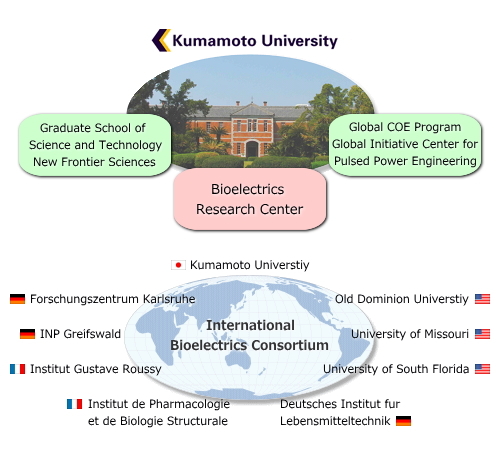 Bioelectric Research Center conducts research and educational activities in close collaboration with Global Centers of Excellence (GCOE) Program “Global Initiative Center for Pulsed Power Engineering” and the Graduate School of Science and Technology as well as many other research groups in Kumamoto University. The International Bioelectrics Consortium was established in 2005 and now includes eight universities/academic institutes and one affiliate member. Kumamoto University BERC plays a pivotal role in the consortium to promote international collaborative activities.